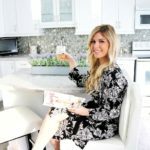 Georgia Eliopoulos is a girl from Toronto who started this blog because she has just so much to say and wants the world to know it. Working in a corporate setting as a marketing assistant, this blog allows her to do what she is passionate about in her down time. Whether it’s trying new products, recipes, or fashion trends, she wants the experience to benefit herself along with all of her readers. She is most proud of being mommy of two little handsomes Mason and Asher, and is passionate about many things whether it be her husband, her little pomchi Kimbo, or anything KATE SPADE. She also believes in cupcakes being something that can always put a smile on anyone’s face- I mean come on, they are bites of heaven.